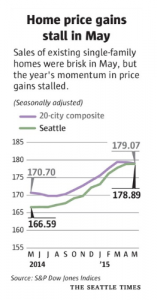 Home Prices in the month of May | Puget Sound Real Estate :: Capstone Ventures Real Estate Inc. In the month of May, prices of homes in the Seattle area remained stagnant even though the overall trend of the last year shows home prices have risen about 7.4%. Although increased mortgage rates are expected to influence the market at this time, readers polled by The Seattle Times stated that the main reason most struggle to buy a home is because they “can’t afford to buy a home here”. Despite the fact that there is a large drop in distressed mortgages which helps stabilize home prices, many believe that there will be a downward trend in home-value appreciation in the coming months.